We could just feel that they had the experience. They knew what we were talking about, and we were on the same page immediately. If a supplier turns up with a school bus full of consultants, then you know it’s going to be expensive and that it can turn out wrong. itelligence turned up with a project manager and the person who was going to solve the task. JP/Politikens Hus has a big spand within the areas of newspapers, publishing, tv, web and other related business areas. 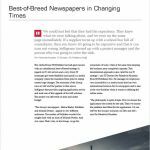 The Media House JP/Politiken has had great success with an untraditional best-of-breed-strategy in regards to IT. 800 servers and a very divers IT landscape give both flexibility and speed in a media company where the transition from print to online creates huge changes. The economy of the Group runs on SAP and the partner in that area is itelligence that provides ongoing application service and took care of the upgrade of the SAP solution. The project was delivered on time and under budget.